30m², 2 bedrooms, terrace with garden furniture, separate WC, well equipped, comfortable, well appointed, comfortable. 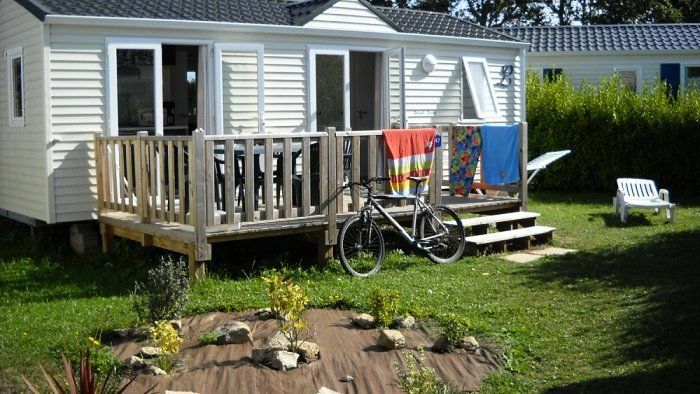 Located in Penmarc'h, southern Finistère, Camping Les Genêts **** welcomes you for family holidays by the sea. Its location 1.5km from the beach will delight young and old. The campsite will offer evening entertainment: cabaret, disco, concerts, quizzes or even bingo. In July and August, activities will be organized for children from 5 to 12 years old. Mobile Home 3 Rooms 4/6 People of 30m², composed of a kitchen corner, a sitting area with sofa-bed for 2 persons, a bedroom with a double bed, a bedroom with 2 single beds, a shower room, separate WC, terrace. The Mobil Home includes a kitchen area equipped with microwave and coffee maker. Blankets and pillows are provided. The terrace has a garden furniture and a parasol.